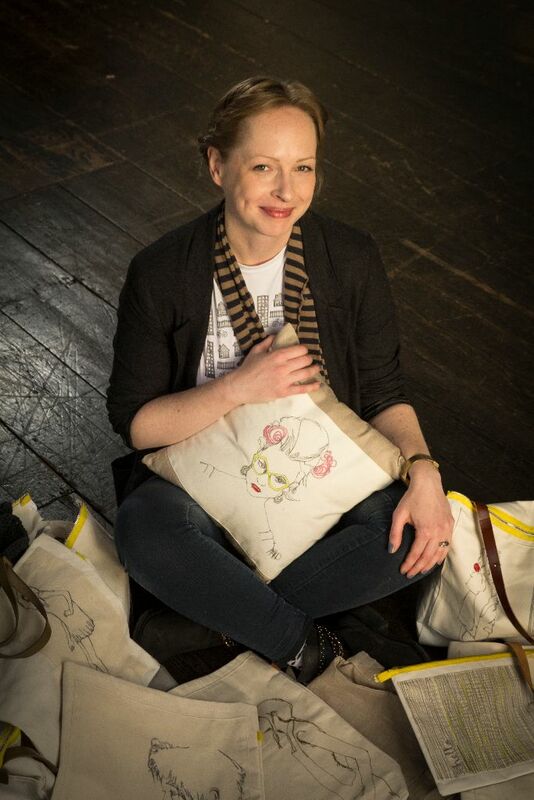 The artist and designer behind Morris Kavanagh Designs marries fine art and design with her unique collection of totes, bags and purses. She tells Rebecca Egan about how she got started and the creative process. I always had a creative flair, but it runs in the blood. Lots of my family are creative and involved in the arts in one form or the other. I have cousins who are sand sculptors and are part of a big sand sculpting festival in Dublin each year. I’m very lucky as well, I am one of the few artists with full parental support. When I was deciding where to go to college they were completely behind me and always encouraged me to follow what my heart told me, and believe in what my hands and imagination could create. Did you train in any form of design? I did a PLC in Stillorgan after school and that really helped me explore art and decide what avenue I wanted to pursue. I had always loved fine art, it really is a true passion of mine and I was delighted to be accepted into LSAD to further my skills. I’m not originally from Limerick but really fell in love with the city over my years in LSAD, I don’t see myself leaving. I completed a degree in fashion there, which is perfect for how I like to work. I was guided down that path by the lecturers. Even the fashion course itself involved a lot of deadlines and is known to be that bit more intense maybe than other major areas. It suits me and I suit it, it is practical and functional and has a precise thinking about it, particularly the design elements and tailoring fits to exact measurements. What has kept you busy since college? Oh plenty of things – I guess the main ones include working with Fidget Feet, and I ran my own alteration and designs in Killaloe ‘Dress by Gemma’. That was great, it suited me well. I got plenty of business through word of mouth and really developed my technique, becoming much quicker in my work. I earned a name which is always great and then I started working in the bridal shop in Killaloe. That was simply terrifying at the start! It needed a whole new skill set and with your wedding day being such an important celebration you always have to be so careful about each single stitch. I then met Marion Murphy Cooney, who is based in Nenagh. She needed an in-house dress-maker so I found myself working with her. Between working with Marion and then the time she spent in Limerick shops, I have seen four years pass. Well I really garnered my skills working in the bridal shop and with Marion, but I loved working for myself. I love that I am a fashion designer and I have never lost my desire to pursue drawing and fine arts. Now I have found a way to marry both passions. I have discovered a way to combine the two. It’s a dream! I have started making my own collection of bags and cushions. I have selected a very specific colour palette for my first collection. I have a wide variety of bags from tote bags, purses, purse-clutch combos, larger bags that some new mothers have said are great nappy bags! A favourite of mine is the yoga bag: I made it because I could never find a bag the right size for my yoga mat and a change of clothes. It’s all under my name ‘Morris Kavanagh Designs’ and it sure is keeping me busy! Where does the design/ fine art element come in? I free hand-embroider portraits onto the bags. I use images from fashion magazines or ones I source online, then I draw them onto canvas and use the machine to stitch the design, moving the fabric as I sew. It took practice! Then the canvas is used either as a main panel in the bag or is sewn on to a panel- it depends on the portrait and on the bag! I use pastel colours mostly but with a pop of a bright colour here and there, again, depending on the individual product. I’ve worked in many different areas and with many different people, between those I mentioned already and even time I had sharing a studio with Emma Fisher by the Milk Market and working with the Lime Tree, so it is nice to be working for myself again. How long have you been designing these products? Not for long at all, just a few months, but working alone is demanding too, particularly when you’re trying to build up stock. It’s great to have the freedom to test out new ideas and I have orders coming in for Christmas gifts since October, which is fantastic! You work from home, is that a good thing or a bad thing? Both! (Laughs). You certainly need to have good self-discipline. In college fashion seemed to have a lot more discipline than other fields so I am well trained from the practice there. You need to be able to close the door of your workroom and lock out all the temptations of getting the housework done, making a phone call or playing with your dogs, it can be tough. Equally, you need to be able to close the door to the workroom and leave it rest so you can do all the house chores and live life. It is great to have everything close and to be your own boss, once you find the balance! What has drawn you to create these bags? Why now? I have always wanted to tie my things together, fine art and design, and now just felt right. Who do you target your product at? That’s so tough to figure. I would say anybody, it is a practical product, stylised but with a broad appeal. Tote and embroidery, I guess the main market would be women aged 20-40. The bags are multi-purpose and the cushions are fashionable and comfy. All products are easily maintained and cleaned. The target market is anybody that needs a bag or would like a cushion really! (Laughs). Is it difficult to source materials? Not really, I’m lucky that I had a particular idea in mind. I wanted strong canvas, I get it from Ireland Canvas, such a lovely guy runs the shop and I’ve bought stuff since my LSAD days there. It is great to support local. I get the leather from the saddlery on William Street and the zips I order but dye myself for that bright lime colour. Oh that’s a tough one! I would love to have my product in various retailers and develop my products further, developing new ranges. This isn’t something I want to rush though. I want to do it right, I recognise that it will take time to build my product and I’m excited to see what the future brings. I definitely want to build on the current designs and bring in an element of quilting somehow. It’s all to be discovered! Now you have told us about these great hand-made (in Limerick no less!) products, where can we get them? If you follow me on Social Media you can contact me directly to place an order, that’s my main way at the minute. You can also see the whole range of products I have designed there too.